A Service is held at 11.00 am. every Sunday other than the 2nd. Sunday,when the service may be hosted elsewhere in the benefice, and occasional services at other times. Please check details on the Calendar. The Church is also used for Weddings, Baptisms & Funerals and at Christmas and all other Festival times. Afternoon teas on Wednesdays. Check the calendar for details. Great Massingham, situated about 12 miles from King's Lynn, is often described as one of the county's most attractive villages with traditional flint cottages. 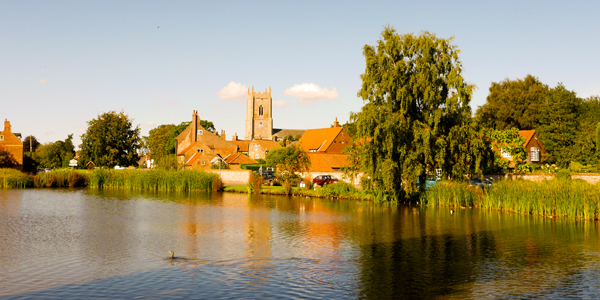 It is also notable for its large green and the many ponds which dominate the village, some originating as the fish ponds which once used to be part of an 11th century Augustinian Abbey, where King Edward I once stayed on his way to the shrine at Walsingham. Massingham comes from the Old English meaning ‘the homestead of the family or followers of a man named Maessa’. The parish stands on an area of former heath, which was enclosed from the late 18th century. The village sign commemorates the 50th anniversary of the end of the second world war. 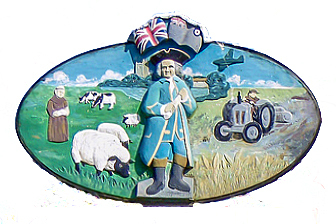 It illustrates village life dating back to the 5th century AD and the village's connection with Sir Robert Walpole. Great Massingham had two parish churches during the medieval period; the other was All Saints’ Church, which stood to the south of St Mary’s. The two churches were united in the mid 15th century, and All Saints’ had fallen into ruins by the 16th century. St Mary's square tower has dominated the village since then. There is a 13th century central porch, the font is 14th century and the painted glass in the south windows dates to the 15th century. The church porch was used as a school room and Sir Robert Walpole, of Houghton Hall, who became Britain's first Prime Minister, was taught there as a boy. As a boy I felt very proud when I was told that Sir Robert Walpole, England’s first Prime Minister, had been educated in Massingham. My grandfather, who was churchwarden, showed me where the schoolroom above the church porch had once been. But there was one thing he didn’t mention, and which has puzzled me until relatively recently: were Sir Robert and his classmates dwarfs? Go and stand in the porch and look upwards. The space between the top of the elegant pointed open arcades at the sides, where the floor would have been, and the apex of the arched roof above it is three or four feet at most – scarcely enough space for a schoolroom, unless the pupils and the teacher were permanently bent double. Obviously, at some time, the roof must have been considerably higher, or the floor considerably lower. The village hall is 80 years old and today stages numerous plays and pantos. Since 2011, the Great Massingham Village Hall and Community Car Scheme together have organised "The Film Club" which shows a popular film once a month at the Village Hall, usually on Thursdays at 7.30pm (doors open at 7 pm). There is no need to join the Club - everyone is welcome. Pop corn, and tea, coffee and cake are served for which donations are welcome. Those without personal transport can be brought to see the films by the Community Car Scheme (tel:01485520823 )The Film Club also organises occasional members evenings and an annual general meeting for which films and/or talks are arranged. The Massingham Historical Society was started in 1997 and has many acquisitions. A collection of photographs and memorabilia, now known as “Sister Laurence RAF Massingham Museum”, was dedicated by ex-BBC commentator, Kenneth Wolstenholme, who was based at the nearby airfield during the war. Massingham was part of 2 Group, Bomber Command. Fifty-two aircraft were lost and more than 150 aircrew stationed at RAF Great Massingham were killed in action over Europe or in flying accidents closer to home. Seven of these young airmen are buried in the churchyard of St Andrew's at Little Massingham village. The village community is as strong and, back in 2006, locals saved the village pub which sits in the middle of the village and is called The Dabbling Duck. An occasion for ringing out the bells - and Great Massingham has a team of Bell Ringers ringing out the changes on its four bells. Read more here.